fantail flo: How to Upgrade Your Backpack Game- my Eva Leather tryout! How to Upgrade Your Backpack Game- my Eva Leather tryout! Hi ladies! Ever wanted a stylish yet durable backpack? Sick of using the same old schoolbag for years and years? I want to introduce you my newest find, Eva Leather. Eva Leather is an awesome bag company that sells gorgeous bags, totes and backpacks that are quite luxurious in design. Seriously, who needs to fork out a few thousand dollars for a designer bag when you've got shops like these? I had so much fun browsing their site for a suitable backpack, as I wanted to upgrade mine which was torn, blackened and rather unstylish. 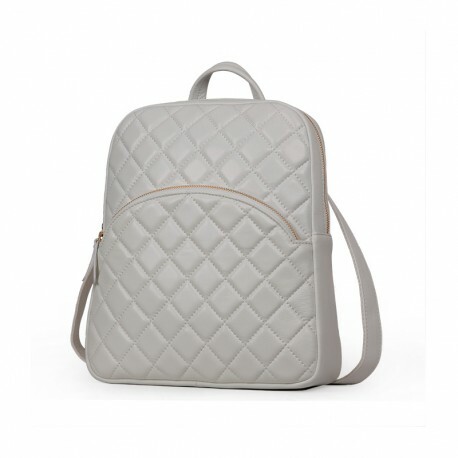 In the end, I chose the Rosaire Bourgogne quilted backpack which stood out to me because of it's luxurious feel. It looked like it's worth thousands of dollars, but it was only 76 euros, which is super affordable and low-cost. To be honest, the quality is pretty good as it's made from genuine lambskin leather, which is a soft, smooth type of leather used for luxurious coats and jackets. It's got a beautiful quilted texture which makes it so photogenic and it comes in black and white. I chose white because I wanted it to match my outfits- I love a bit of monochrome and the white backpack is perfect to style with shorts, leggings or a jumper. I've shown you the size of it- it's pretty standard and perfect in size, good enough to fit a lot of notes and a few books, and maybe a clutch and a wallet. I adore the design- it's simply stunning and feels really durable! Check out Eva Leather now!